~ Where every piece of paper is a potential masterpiece. Hello everyone, today I made a card for my sister-in-law, who is battling cancer. I send her cards quite often to lift her spirits. The card today was also my Design Team submission for Creative With Stamps Challenge. November’s challenge is “Feathers“. I have wanted to use this fabulous stamp set I received from Unity Stamps named Her Own Hero. This sentiment is so wonderful to honor any lady that is fighting any type of personal fight. I stamped the feather stamp in VersaMark ink and heat embossed it with white embossing powder. I then watercolored the feathers and the background using ZIG Clean Color Brush markers and a water brush. I spritzed the watercolor panel with Perfect Pearls mixed in water to give the design some sparkle. I mounted the watercolor paper panel onto a black mat and mounted that onto a white card base. I stamped the sentiment in Memento Tuxedo Black ink, popped it up with foam tape and added Doodlebug enamel dots and called it done! Please follow the link Here to the Creative With Stamps Challenge blog so you can play along with our challenge, remember you can enter anything with a Feather theme, and we can’t wait to see what you create! Please follow our blog by clicking on the “Follow Me” button and Like us on Facebook and follow us on Instagram so you don’t miss a thing. Thanks for stopping by! And remember to honor all those that have to fight like a girl. Hello there! Today I was working on Valentines, one of my favorite cards to make 🙂 I used the adorbs digi set from Sunsational Stamps called Monster Love. There are so many cute monsters and saying in this set, I am going to make a bunch of valentines with each one! I printed out the monsters and chose this one-eyed fuzzy one. I colored him with three of my green Copics, flicking toward the center, working from dark to light, to try to give the illusion of fur. I die cut the word LOVE and some hearts from Doodlebug glitter paper that has a tone on tone chevron pattern. I glued those onto a black card base. I stamped the word YOU in VersaMark, added white embossing powder and heat set it. I added a googly eye to the monster and popped him up over the O in love. Please head on over to our February Challenge by clicking Here and enter your own Valentine for a chance to win. You also can download a free Digi when you head on over. I am super excited to be entering my card in the Creative With Stamps Challenge #23, you can access their blog Here to enter your creation or just to get some fabulous inspiration! The second challenge I entered my card in is Simon Says Stamp Wednesday Challenge and you can find the link to that Here and the third challenge is with 2 Crafty Critter Crazies Challenge #11… they allow make-believe and fantasy type critters as well there, so I figured a monster was ok with them. You can wander over there by clicking on the link Here. The forth challenge is with Word Art Wednesday Challenge #321 that you can get to by clicking Here. I hope you enjoyed todays card, thank you for stopping by, please follow our blog by clicking on the “Follow Me” button and Like us on Facebook and follow us on Instagramso you don’t miss a thing! I used 2 pieces that are 4-1/4 x 5-1/2 of Nautical Navy by Bazzill. I die cut a 2-3/4″ stitched square into the top layer. I die cut the Nativity scene in both gold mirror board by Bazzill and pearl white cardstock using the NativityScape die by Sugar Pea Designs. I used half of the white die cut piece adhered directly onto the back panel and I adhered the gold Nativity part directly behind the stitched window opening. I then popped that panel up using foam tape to give the scene dimension. I stamped the front panel with a sentiment from Strawberry Jude Stamps Tag It-Christmas stamp set, using Versamark ink and sprinkling it with gold embossing powder and heat it to set. The inside was stamped using the Merry Christmas sentiment from the same set and heat embossed the same way. I hope you enjoyed todays card, thank you for stopping by, please follow our blog by clicking on the “Follow Me” button and Like us on Facebook and follow us on Instagram so you don’t miss a thing! Salutations! All that glitters is NOT just gold, it is silver, and snow and glass too! I had to make some tags for our annual Christmas Ornament Exchange party and could not resist Sunny Studio Stamps Holiday Style to fill the bill. I started out by stamping the pine branch in VersaMark ink and sprinkling Ranger Silver Tinsel Embossing Powder on it and heat setting it. This was the first time I used it and just LOVE the look. Helpful Tip… Begin the heat setting/melting process from underneath the image, then finish up on top, the reason is, it gives the glitter pieces a chance to adhere and not get blown right off the paper. Same concept as when you use the thick embossing powders. Next I stamped the ornament, beginning with Close To My Heart Glacier ink for the base layer circle and stamping CTMH Lagoon, which has been stamped off once, as the shadow piece. It was way too dark to do without stamping it off first. I added a piece of silver jewelers thread to “hang” it from the branch. I popped up the ornament with a foam square, stamped “FROM” in Lagoon ink on the bottom, snipped off the top corners, added some matching blue baker’s twine and called it done. I thought this would be a great project to submit for a Non-Traditional Holiday Colors challenge #273 going on at Color My Heart – Color Dare Challenge Blog, you can see all the great inspiration Here or even submit some inspiration of your own! I hope you enjoyed today’s tags, thank you for stopping by, please follow our blog by clicking on the “Follow Me” button and Like us on Facebook and follow us on Instagram so you don’t miss a thing! Hello, today I had to make cards for a couple of friends that are struggling with difficult life issues. The style of the cards I created lend themselves to really any occasion. They can easily be adapted for birthday, congrats or sympathy, just by changing up the sentiment and color choice. I did not want these cards to be maudlin, I wanted them to lift the spirits without being silly or too light-hearted. This first card I used Raisin Boat Growing Love stamp set that I stamped using Memento Tuxedo Black ink and Pacifica Blue ink from CTMH for the berries and graphic blooms. I stamped twice so I could get two shades of blue and I LOVE the lighter version, it is so pretty. I added Nuvo Crystal Drops by Tonic Studios in Navy to add dimension and interest to a few of the blooms. The HI die cut is from MFT, I got it free with a promotion, and you all know I love promos! I cut it several times in Beetle Black cardstock by Doodlebug, glued all the layers together and topped it off with clear Wink of Stella, and dotted my “I” with an enamel dot. I finished the top layer off with a piece of ribbon from my stash (that looks like it was made just for this card) and added that layer to the card base. For the inside of that card I used Lawn Fawn‘s Scripty Sayings and added a little butterfly stamp from a CTMH set, layered that on black and called it done! My Floral Hugs card was created using one of the blooms from the same Raisin Boat set Growing Love. I stamped the flower in Terra Cotta ink from CTMH and then re-stamped it using Versamark ink. I then sprinkled clear embossing powder on the images and hit it with the heat tool. I ran the paper with the images through my eBosser using a CTMH confetti embossing folder. I fussy cut out the flowers and set aside. I then cut a piece of Amy Tangerine paper I have had FOR…EVER on a bit of an angle and adhered it to the card base. 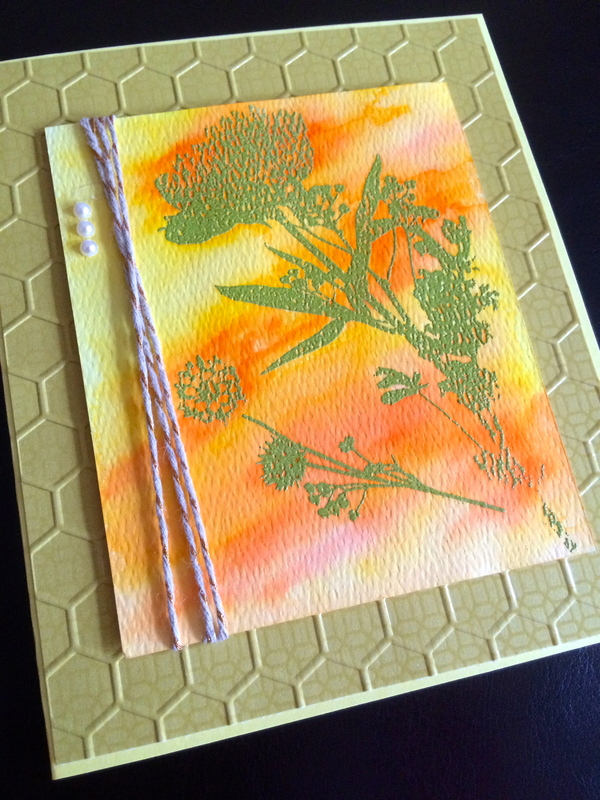 I added the flowers to cover up the seam and stamped Big HUG in Terra Cotta ink from my CTMH Big Hugs stamp set. For the inside I stamped off that same flower in the Terra Cotta to make a much lighter version and then stamped Thinking of You from the CTMH Seaside Greetings stamp set (also in Terra Cotta). 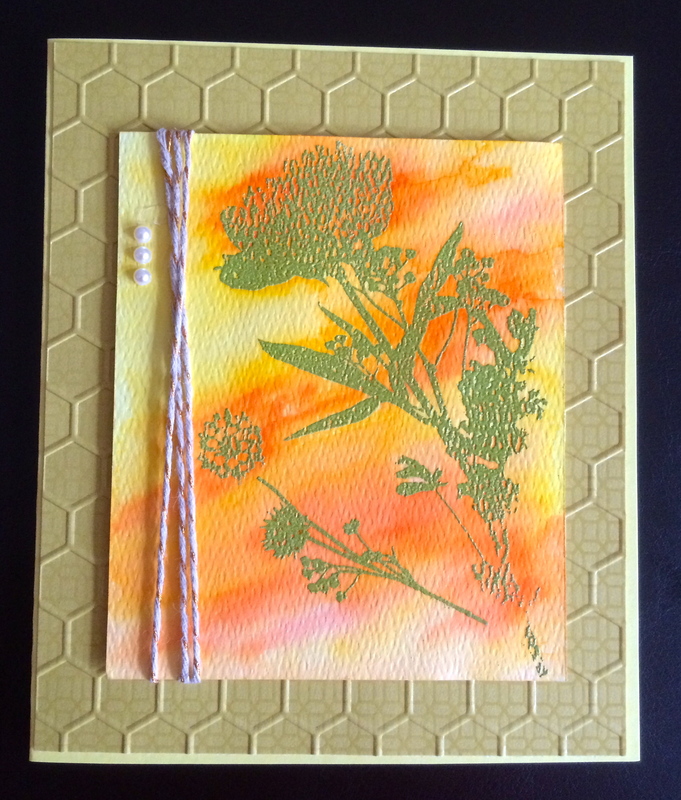 I layered that panel onto the Amy Tangerine patterned paper, added it to the inside of the card and Voila! I hope you enjoyed the cards for today. Please follow our blog by clicking on the ‘Follow Me’ button, Like us on Facebook and follow us on Instagram so you don’t miss a thing! Long time no see! I am happy to be scrapping again today, I have been on hiatus due to work getting in the way. Sigh…. But today I was able to make a few projects that you can check out over the next few weeks. I used ZIG Clean Color Watercolor Markers as well as ZIG Pearlescent Watercolor – Jewel Box, Tim Holtz Distress Watercolor Paper and a Stampendous stamp that I have literally had since I started stamping well over 20 years ago. I just LOVE this stamp, the bunny is so adorable. The first thing I did was stamp the Easter stamp with Versamark and then I used Ranger Silver embossing powder. I like using this method when I want to contain my watercolor for a CAS card. I used a combination of markers and the Pearlescent paints, then mounted the watercolor paper on a black mat then onto some Studio Calico patterned paper that I had in my stash. I actually made several of these, giving a different color background patterned paper for each one. I hope you liked our project today and would love it if you would click on the ‘Follow Me’ button and Like us on Facebook so you don’t miss a thing. Happy weekend all! I saw on Facebook that today is National Card Making Day, so… I made a card! I wanted to use embossing resist with my Zig Clean Watercolor Markers. 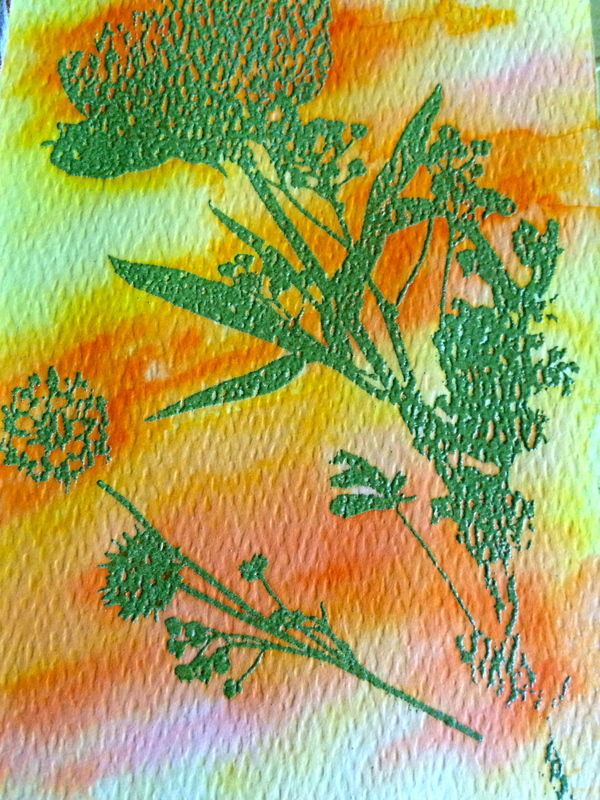 I started with 140 LB cold press watercolor paper and stamped it using one of the lovely images from CTMH September Stamp of the Month Paper Garden. I stamped it with clear Versamark then coated it with Ranger embossing powder in Lettuce and heated with my heat gun. Next I randomly brushed orange and yellow Zig Clean Color Real Brush markers, then using a medium side flat paint brush I added water and swept the brush from left to right on a slight angle. Then I wrapped some bakers twine around the watercolor paper fastening it on the back of the canvas, and added three pearls. For the base piece I used CTMH B&T Duos in New England Ivy, ran it through my eBosser with a honeycomb embossing folder and adhered all it to a light yellow card base. I hope you liked today’s card. Happy Card Making Day! Please follow our blog by clicking on the left hand side. Like us on Facebook too so you don’t miss a thing. Where every piece of paper is a potential masterpiece.